It started, as I like to recall, because of the empty page it left in my album with no stamps available to collect, but probably more likely through hearing the name mentioned frequently in the news that played throughout the day in our North London home in those years. Trieste had become generally famous, however, though Churchill's Fulton speech back in 1946 foretelling the potential Soviet threat that had created in effect an 'Iron Curtain' in Europe, between 'Stettin in the Baltic to Trieste in the Adriatic''. The name continued to be broadcast as it was made an independent state under Allied mandate in 1947 in their attempt to quell any potential Cold War confrontation between Italy and Yugoslav over its ownership. Eventually it was re-absorbed by Italy in 1954. Despite its fame, little was actually known of the city at the time. Just one film in the plethora of war films in the 1950s, John Paddy Carstairs' 1948 'Sleeping Car to Trieste' bore it in its title, but despite this, its action was shot mostly in Paris and then on board the train itself with nothing of Trieste itself. My imagination, however, forged it into a city of intrigue akin to shadowy postwar Vienna Carol Reed had made famous in 'The Third Man' or the war-torn, espionage-driven Berlin of his later film,'The Man Between'. Similarly, little has been written about Trieste then and in the decades that have followed and it seems Jan Morris' 2001 curiously entitled travelogue, 'Trieste and the Meaning of Nowhere', is the only work to have paid it any real heed. Here she maintains Trieste had been a famous and celebrated city, in the eighteenth and nineteenth century as a result of the maritime ambitions of the otherwise land-locked Austro-Hungarian Empire. 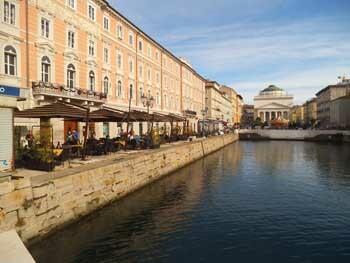 The Hapsburgs, the ruling house of this sprawling, multi-cultural central European Empire,, had developed Trieste not only as the only outlet for its navy but at the same time into a city of charm and imperial grandeur, a 'Vienna by the Sea'. Yet in the last century, following the Empire's defeat in the1914-1918 World War and dismemberment into ethnic groupings it has become, she suggests it became an 'allegory of limbo', an 'indefinable hiatus a 'great time capsule' to their ambitions. Its location at the head of the Adriatic, Morris suggests does create some interest and it could be perceived as the crossroads of European cultures, a 'mitteleuropa melting pot' with the majority speaking 'Tristine', a variant of Venetian Italian, but with some German within the local bureaucracy and a local Slovene variant in the villages of the surrounding Friuli Venezia Guilia region. Fascinated, I booked a small hotel there and a cheap weekend Ryanair flight from Stansted to explore further. The small plane arrived in a grey part-rain, part-drizzle mid-October day at the excessively-named Ronchi dei Legionari Airport Trieste Friuli Venezia Guilia - sensibly shortened to Ronchi Airport or sometimes Airport FVG.. The main building is drab, functional and not-entirely efficient airport for such a grand title and I felt a disappointing introduction to the imperial splendour I was hoping to see. The local shuttlebus into the City stopped several times as it passed through Monfalcone, a predominantly pink and white painted, prosperous post-war town, and then left the main Trieste road a few miles further to in visit Duino, a small village of two castles and associations with 'lyrically intense' poet of Austro-Hungarian Imperial days, Rainer Maria Dilke. Returning to the main road, the bus began then drop down again following the coastline into Trieste. On the left, the Karst range of hills rose sharply from the roadside with a few glimpses on its summit of the huge Italian-built statue Victory Lighthouse commemorating the their retake of Trieste after World War One. To the right the through the row of tall pines gave the Gulfo da Trieste could be seen now shining in an emerging sunlight that had encouraged many couples to meander the long promenade on the nearside bank.. The shuttle terminus was within the ornate Central Station complex opened by the Hapsburgs in 1857 to strengthen transport links with Vienna. The statue in the square before it commemorated the tragic Empress Elizabeth, wife to Franz Joseph I of Austria-Hungary, mother of Crown Prince Rudolf famous for having committed suicide at Mayerling in 1889. The Empress herself herself was sadly assassinated in Geneva soon after in 1898. Morris' notes that 'Sissi' was fondly regarded locally, having found Trieste a place where she could wander safely in its streets and away from the formalities of their Vienna court. My own first wander from my small hotel in the afternoon took me immediately into the Piazza Vittorio Veneto a balance of highly ornate, 'icing sugar' facades of the Austro-Hungarian period to the sides and to the centre a plain, modern 'flat slab' seating construction surrounding, a powerful, classical sculpture, the 'Fontana dei Tritoni'. with its massive sea gods holding up a huge scallop shell that exuded water down over the heads of deities below. Taking up the whole of longer side of the Piazza, the main Post Office, said to be one of the largest in the world, epitomising Hapsburg Imperial confidence and assurance, yet internally, proving difficult buying postcard stamps. My stroll soon reached the picturesque Grand Canal, that had been developed by the Hapsburgs between 1754-6 as the only completed canal of the many planned that allowed small vessels to enter the city from the Bay. It proved a great spot to enjoy an inexpensive lunch of the city's renown sea bass and its local prosecco. The view across to the splendid domes of Saint Spiridione, dating from 1869 said to be built as the result of Hapsburg Empress Theresa's concern, despite being a Catholic, to maintain the freedom of religious practice for the city's Greek Orthodox population. After, I stolled a little further on still, past more ornate facades, to the Piazza Unita D'Italia which despite its name was developed during the 1800s again by the Hapsburgs. The square is surrounded by more magnificent buildings with ornamented gold fascia that glints powerfully in the sunlight. Many large open air cafes surround the square selling cakes and delicacies as they would in Vienna.. There are also a good number of interesting statues but the event had attracted so many visitors that these were scarcely visible amid carnival flags and bunting. 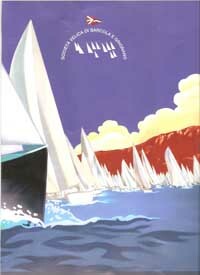 The great event was the Barcolona to be raced in two days time. I had seen banners proclaiming the Barcolona, along the roadside on the bus trip into the city and now knew what they proclaimed. By good fortune my triped had occurred at the same weekend the city's annual yachting regatta, a great maritime event with an estimated 2,000 plus yachts taking part. The whole bayside was set over to the City's famous 'Mercato de Mare' or sailing fair' with a great many stalls retailing all types of seafaring products and activities. That evening, I found a pleasant restaurant not far from the Central Station. I felt that the more I had continued to explore Trieste that first day day, the more apparent was the Hapsburg cultural legacy in this outwardly Italian city. Freud and Mahler regularly visited the city and Bellini, Rossini and Verdi all have a streets named after them for example. 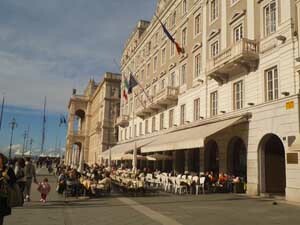 Also James Joyce who spent many years in Trieste writing 'The Dubliners' and much of 'Ulysses' here. He has a lifesize bronze statue on the bridge crossing the Grand Canal near where he can mingle with the crowds as he often did in life. Te next morning was sadly grey and drizzling, less a day for wandering and discovery. Gladly, Trieste has one of the red-bus hop-on-and-off city buses that circle the city in an hour or so - ideal for the day I decided. As I took the brief walk along the harbour to the pier, the Malo dei Bersaglieri to catch the first 9.00 trip, many of the 'Barcolona' stalls were already set up again and trading. On the bus a friendly young lady introduced herself as Benni our guide - 'I know it's a man's name but it is OK here - it's short for Bernadette' she confirmed.. The drizzle turned to a real shower of rain as we drove up the surrounding hills and so when arriving San Giusto Cathedral, I spent an hour or so inside. As a cathedral dates from the fourteenth century but much of the building is earlier. It has a great range of earlier relics. Most impressive even when you are wet are the early 'Ravenna-like' Christian mosaics set high into the centre and left apses. I also spent a little time after looking at the many Roman relics and the powerful Italian World War One memorial but the bus returned as the rain resumed and I moved on again. That afternoon I found my way to the major of Trieste's many museums - another Hapsburg legacy in the City. Museo Revoltella, is the largest, has a fine, gracefully displayed collection of paintings, sculpture and furniture that demonstrated further both the high elegance of Trieste's glorious Hapsburg days and the sense of overseas ambition. 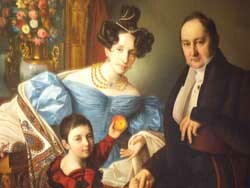 There were among the works displayed, many portraits of grandees of the Hapsburg times as well as a fine portrait of Archduke Maximillian, painted in 1868, the year before he was shot in Mexico. I particularly noted the impressive allegorical marble statue on the first floor landing entitled 'The Cutting of the Suez Canal' . Here, the graceful female figure of 'Europe' (or more likely Austria-Hungary) links hands with two bearded figures representing the Mediterranean and the Red Seas with Mercury between them indicating to the young goddess Navigation the new seaway. Between the visits to San Giusto and the Revoltella Museo, I stopped at the small harbour of Gignano, an ideal place to take a longer lunch and hope the rain stopped. 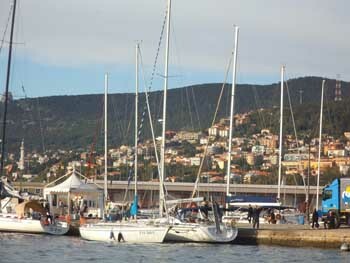 Though small, there were more than for a hundred yachts moored, a couple of terraced restaurants and an attractive view. I was the first to take a table but the terrace filled quickly with mariners in their multicoloured yachting gear arriving in fours and fives bringing. They were all showing a clear enthusiasm for the next day's 'Barcolona'. The group next to me spoke in several languages to each other and had clearly come together specifically for the event. Suddenly, they and the rest all left sensing, I gathered, the arrival of a valuable breeze for practice.. The next day, the day of the 'Barcolona' itself was again warm and sunny. To avoid the crowds that had already started to gather in the harbour, I had decided to visit the famous Miramare Castle out along the Gulf and by walking along the promenade to the Castle where I could see the regatta en route. The Regatta was already underway and I joined the many spectators along the route admiring the spectacle of so many yachts out in the gulf. Sadly there were a little further to the other bank of the Golf than I had hoped than and getting photographs that did the spectacle justice proved difficult. But it was still a really great spectacle to have seen. The Miramare Castle is really the major tourist spectacle in Trieste and was already busy with several coach tours as I arrived. Started in in 1856 by Archduke Ferdinand Maximillian, younger brother to the Emperor, Franz Joseph, and completed in 1860 and built on an idyllic spot just above the Gulf it gave fine views back to the city itself. 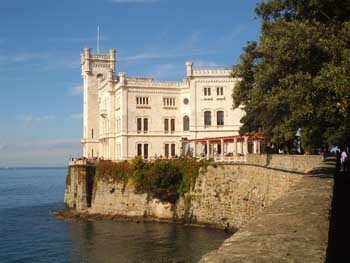 Throughout it proved the most significant edifice in Trieste of Hapsburg Imperial vainglory that I had been exploring. All the sumptuously furnished rooms had a naval theme with Maximillian's own apartment comprising cabin for sleeping and a study that was a replica of the boardroom of the imperial flagship of the time, the 'Novara'. I took lunch in a restaurant on my way back overlooking the Gulf and the yachts were spreading wider over on the far side of the Gulf. I reflected on my findings. Although Trieste is very Italian today in its everyday comings and goings, it is also a sad memorial to the ambitions of the Hapsburg Empire. The body of Maximillian, after the failure in Mexico in 1864 was brought back through its small harbour as were the bodies of Archduke Franz Ferdinand and his wife, assinated at Serajevo in 1914, leading to the First World War and then to the Empire's demise. Yet to be more positive, looking across the bay, it could be said today especially that Trieste has achieved the great maritime hope that the Hapsburgs had hoped. The magnificent Barcolona, has international matitime status, not as the source greater imperial power they had wished but as one the greatest centres for the highly prestigious world of yachting. Perhaps Trieste is now not entirely in limbo as Morris suggested. The Hapsburg dream has arrived in part at least.